Our Shared Lists is a simple, easy-to-use app that allows you and your friends to share constantly updated, dynamic lists. Create secure, password-protected lists for sharing confidential items! Coordinate on shopping lists, things to do, projects, ideas, and anything else, from wherever you are. Our Shared Lists has a clean and intuitive design, not bloated with complicated task management or social networking features. Just make a list, and share it! Pick a username of your choice. An optional email address can be provided for account recovery. We collect no other personal information. Create secure, password-protected lists for sharing private and confidential items. Password-protected lists are secured with military-grade 256-bit AES encryption. Share important financial information (account numbers, PIN codes, etc. ), family passwords, intimate personal lists, and other private items – we can't read them! 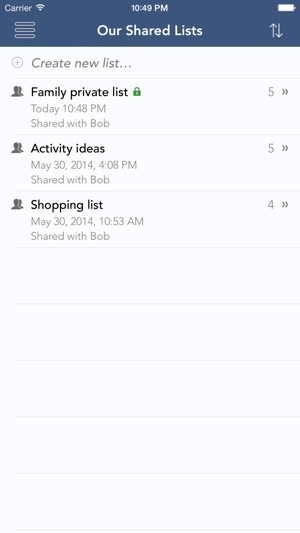 • Create lists and items with a simple tap. • Add notes to items. • Mark/unmark tasks as completed (swipe to the right). • Each list can be shared with a different person, or just make your own private list! 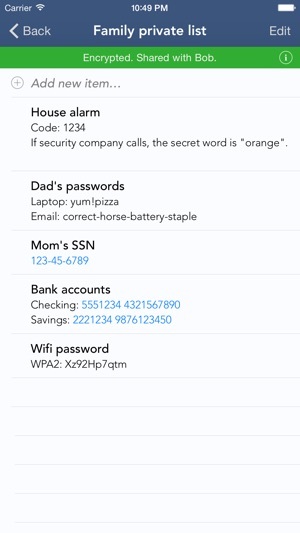 • Password-protect lists with military-grade AES-256 encryption. 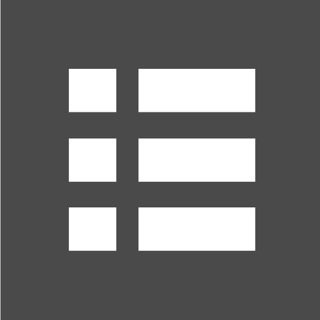 • Synchronize your lists across all your devices. • Access your lists offline, when no internet connection is available. • Receive notifications when lists are updated. • Customize the interface with various color themes. • Up to 3 lists may be shared. • Two users allowed per list. • Share all your lists. 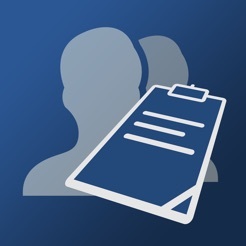 • Share each list with up to 50 people – share lists with all your friends and family! • No recurring subscription fees. This one-time purchase gives you unlimited use of Pro features. My wife and I use the app for a list of things she would like me to get done around the house. It’s is amazing works very efficiently and gives updates to changes on lists to let each other know when something has been added and or completed. Works just as it says never had a problem with app. I've used a couple of to do lists before a couple I liked but this one blew them all away. Only improvement I could suggest is when editing the list to delete completed to be able to select all at once instead of one at a time.